Sally Hansen Nail care review / Gee Whiskers! Firstly I have to say that I love the bottle. Treatments aren't like nail polishes, there isn't that immediate gratification that one gets after you'd applied it. So it's important the they are presented in a way that makes them a pleasure to use. I love the purple bottle with the gold lid. It is suggested that at first this product is used for 4 days and thereafter it can be used as a base coat under nail polish colours. They say you can expect up to 70% thicker nails. I had incredibly weak nails that were so thin that they'd bend and even fold back when I did certain things. After 4 days I noticed that my nails were noticeably stronger and the slight discolouration that I had on my nails was gone. I wouldn't say that my nails were 70% thicker than they originally were but the condition of my nails improved to a satisfactory level. I continue to use this as a base coat, which I apply about once or twice a week - all depending on how long my nail polish lasts without chipping. I am definitely noticing and improvement in the thickness of my nails as I continue to use this. I battle with cuticles that are thick and the skin grows quickly over my nails which I have to push back regularly. This cream is a quick and easy way to remove excess cuticle skin while conditioning the area around the nail. I am not a fan of cutting cuticles so this appeals to me and I much rather prefer it to dealing with scissors. I'll definitely continue purchasing this product once I finish this tube. It is said to promote nail growth of up to 30% over a 5 day period. My experience with this wasn't quite that much but I have incredibly slow growing nails so I was pleased with the results. What I have noticed while using this is that my nails have become stronger and more healthy looking. I think over time while using this, my nails will react better and I'd get better results. What is great is that you can use this as a base coat to your normal nail polish so you don't have to give up on wearing colours. I saw on the Sally Hansen website that they produce this nail treatment in various colours, I haven't been able to find any of them in any of the stores that I frequent but I do love the idea of it and would definitely purchase it in a colour. Overall I am incredibly happy with the treatments I purchased, especially because I picked the 2 nail treatments up for R50 each and the cuticle remover for a mere R36 on sale at Pick 'n Pay of all places. 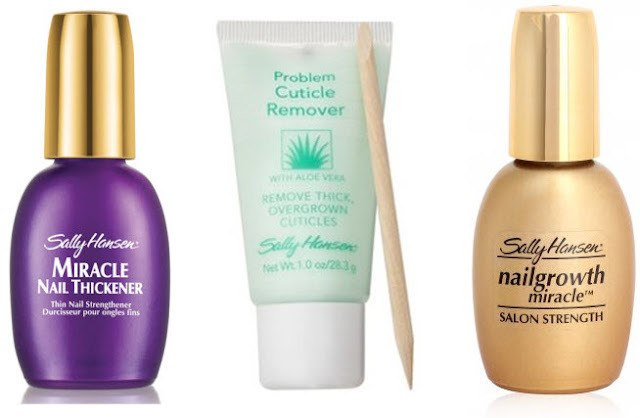 I have my eye on the cuticle remover lotion. Way better than cutting :) great post!